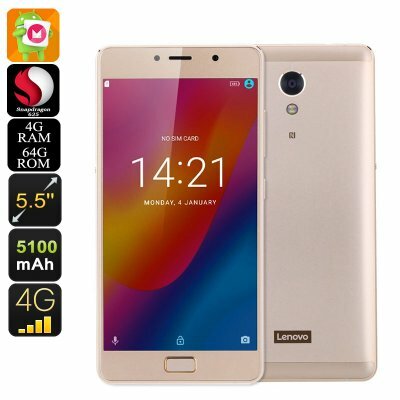 Successfully Added Lenovo Vibe P2 Smartphone - Snapdragon CPU, 4GB RAM, Dual-IMEI, 4G, 5.5 Inch FHD Display, Fingerprint, 5100mAh, 13MP Cam to your Shopping Cart. The Lenovo Vibe P2 Android phone, with its Qualcomm Snapdragon 625 CPU that has been clocked at 2.0GHz, is a powerful smartphone that allows you to tackle the latest Apps and software features available. Along with its Octa-Core processor, this Android smartphone comes furthermore with 4GB of RAM to truly let you enjoy an exceptionally powerful and lag-free user experience. No matter what you throw at this cell phone, there is nothing that will slow it down. With Google Play installed, this Lenovo phone gives you access to millions of free to download games, movies, and Applications. With this smartphone in your pocket, you’ll never have to feel bored again. In order to allow you to take the absolute most out of its powerful hardware, this Android phone packs an epic 5100mAh battery that delivers up to 30 hours of continuous usage time. With all this juice at hand, you’ll be able to get through multiple days without ever again needing to worry about battery life. Packing 64GB of internal storage and supporting a 128GB SD card slot, this Android smartphone holds all the storage necessary for you to save all your files and media alike. On its beautiful 5.5-Inch display, you’ll be able to now fully enjoy all your favorite games and media stored on your phone in breathtaking 1080p Full-HD resolution. With 4G connectivity and Dual-Band Wi-Fi, this Android smartphone allows you to browse the web at lightning speeds. Whether you’re at home, in the office, or enjoying a hike outside – from now on you’ll always be able to stay connected to the web. Additionally, it supports Dual-IMEI numbers thanks to which you’ll be reachable on two phone numbers at all time. With this Android smartphone at your side, you’ll always stay connected to friends and family no matter where you’re at. Intergraded within its front button, this Lenovo Vibe P2 packs an ultra-fast fingerprint scanner that provides high-end security. No longer will there be the need to remember passwords or annoying unlocking patterns as, with this Android phone, you’ll be able to access all your files with the touch of a finger. Additionally, this cell phone comes with a stunning 13MP rear camera that, thanks to its Sony sensor, allows you to shoot breathtaking images at any time of the day.